Hailing from the snow-swept land of Switzerland, Bodum combine the best in affordable European design with a whole collection of kitchen goods to help you get your home in order. Next time you’re hosting a party at your home, be sure to serve your beverages in the Melior Wine Decanter. 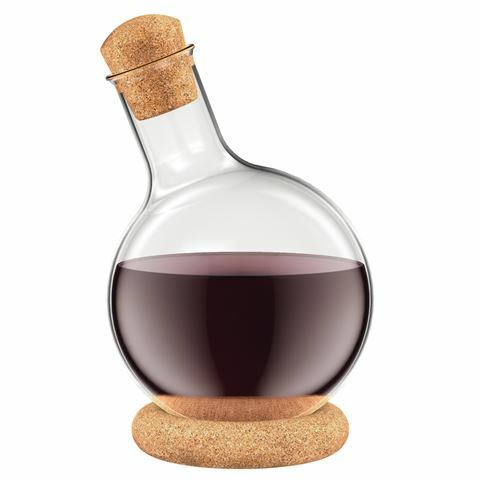 Crafted from borosilicate glass and cork, simply fill the jug with older red wine and secure the cork cap on top. In no time at all, the wine sediment will begin to separate, plus by preventing oxidizing your favourite red, you’ll be able to preserve the flavour for longer. Crafted from borosilicate glass and cork. Fill the jug with older red wine, put the cap on and place it on the cork stand. Separates the sediment in older wines while preventing oxidation. Dimensions: 22cm (h) x 12.5cm (w).